Bales being load on a lorry for Ugie Valley Feeds. A leading producer of hay and haylage has warned of shortages this season. Fraser Mackintosh of Ugie Valley Feeds, based near Peterhead, said supplies will not be readily available this season. “After 2017 being such a difficult season for hay and haylage production we, like every other producer were hopeful of a better season in 2018,” said he said. He said dry conditions had led to very low yields, and although the quality was fantastic, some fields had only achieved half of the expected yield. “Many equestrian customers believe hay to be plentiful due to the dry sunny conditions but this is just not the case,” added Mr Mackintosh. 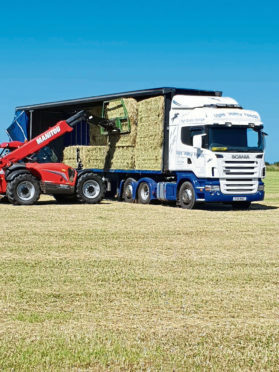 “Last year to keep our customers in Scotland supplied we were able to source good quality hay from the south of England. It appears to be the case that it has been worse down there and surplus hay will not be available.